Hi Friends! I shared this post over at Infarrantly Creative a few weeks ago during Beckie’s Pennywise Presents Series and I thought you all might enjoy it too! I am a huge fan of the Dollar Tree and all of the amazing things I can find there for a buck, not to mention their holiday section is awesome. One of my ‘go-to’ items at the Dollar Tree are these cylinder glass vases. 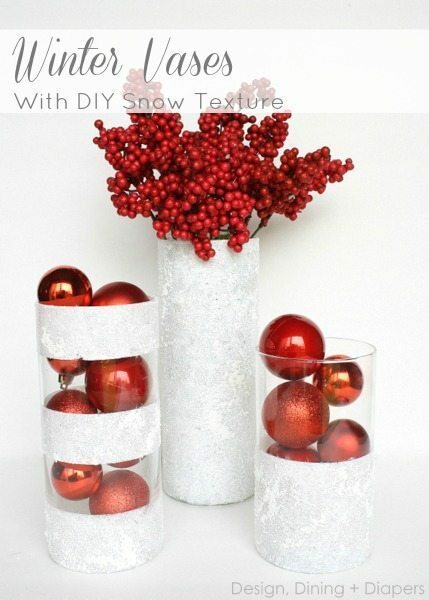 There are so many projects you can do with them, but today I’m showing you how you can make Winter Vases With DIY Snow Texture. 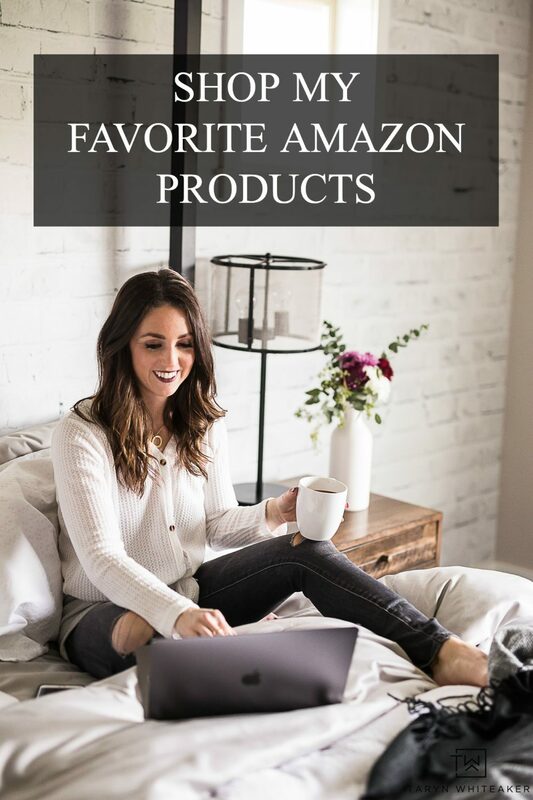 This is the perfect gift to give to just about anyone because they are so versatile! 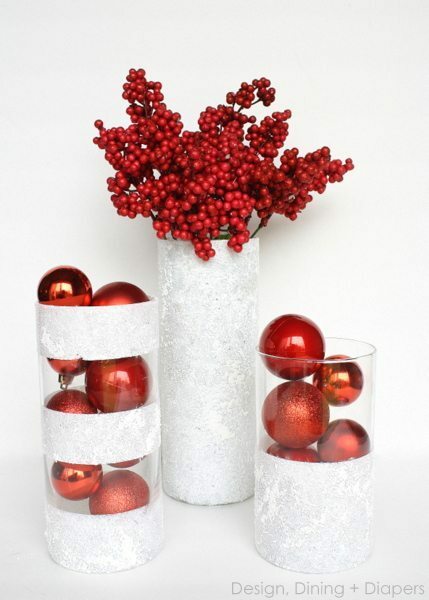 The white snow effect against the clear vase allows you to pair them with just about any accent color, making them easy to customize for different people and easy for the recipient to change down the road. 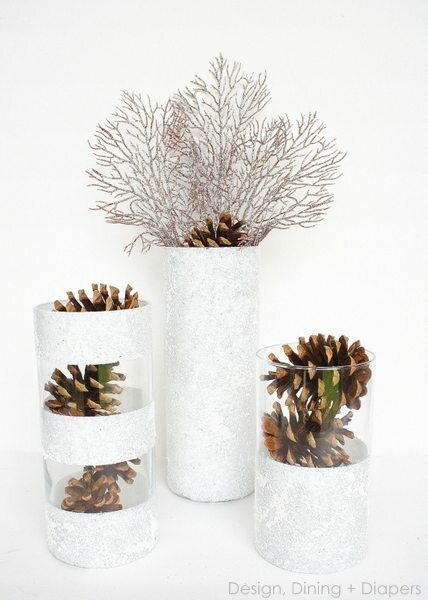 If red isn’t your color, try adding pine cones and silver leaves for a winter wonderland theme…. ….or try golds and silvers for a more elegant look! I purchase a lot of my glass vases at the dollar store, but sometimes you can only find the medium size there. To keep it under $10 you could use three medium size vases or purchase additional sizes at Hobby Lobby, Michaels or JoAnn’s and use a 40% coupon! To create perfect stripes on my vase I covered the entire vase in blue painter’s tape, stacking each line perfectly on top of one another. This helps to create a perfectly straight line. Then I removed the tape from the sections I wanted to paint. 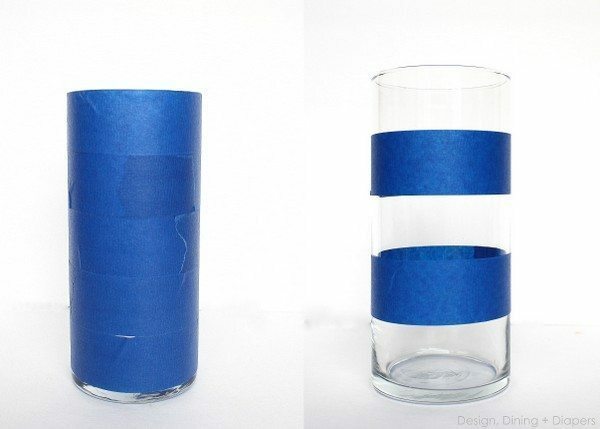 Once you remove the tape, you are left with perfect lines and beautiful Winter Vases! ALL of the fillers I used in all three displays were purchased at the Dollar Tree! That includes the ornaments, pine cones and foliage. So depending on which vase theme you choose, you will only be spending about $2-5 on fillers. Great deal! So which style screams YOU?! And if you are interested, you can view more of my holiday projects here! Beautiful! 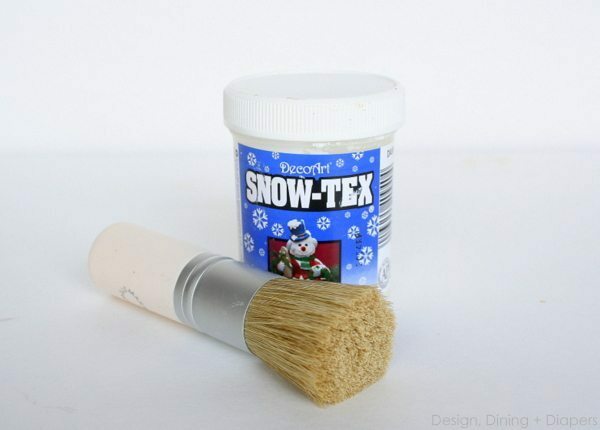 I guess you can find the Snow Tex at a craft store like Hobby Lobby? Very cute and I love that it’s affordable too! absolutely genius! love all the different fillers you used! wow! 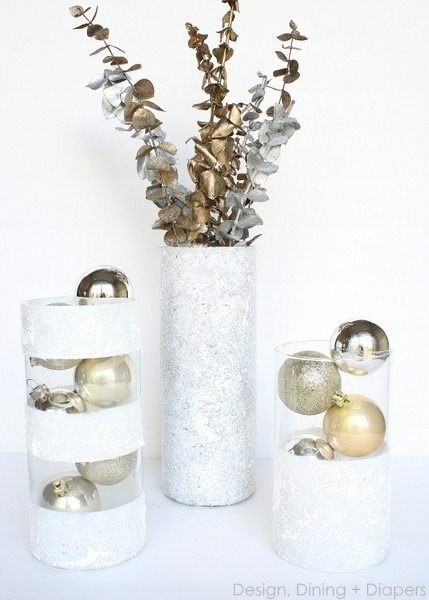 Pretty idea for vases! This year I could use the first and third styles of vases in my home very nicely–they would fit right in! Love, love, love this idea!!! Beautiful! Thanks for sharing! great job! like the pinecones! Love this. So lovely and elegant. taryn! beautiful vases, and great tip about the tape!! love these! catching you! I love this! My favorite is definitely the one with the pinecones. 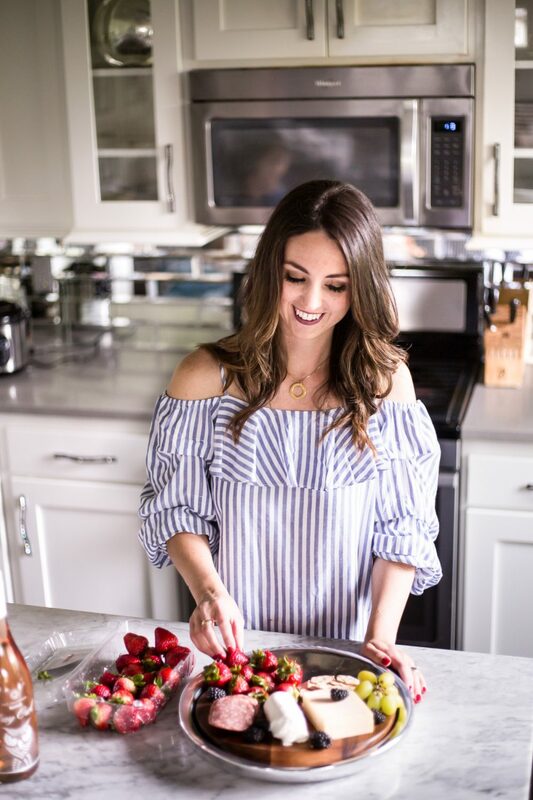 I ADORE using pinecones as decor around Christmas! I absolutely loved this project and I know my readers will to.